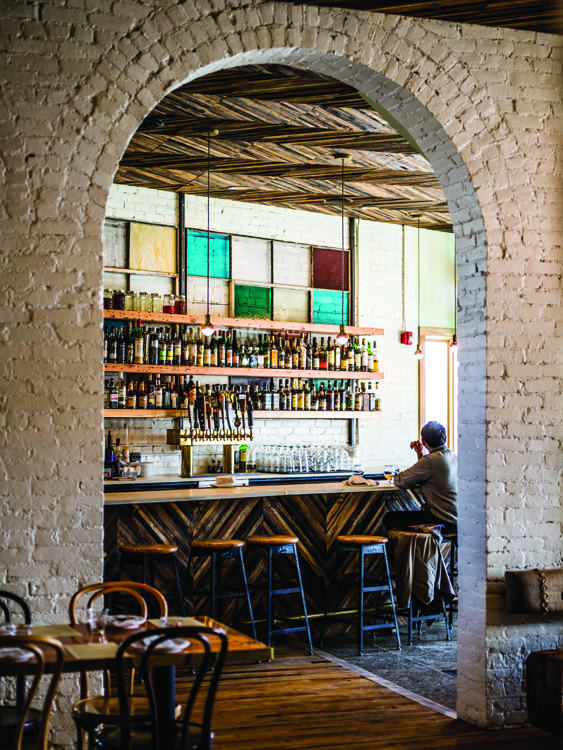 Detroit has always been full of food options beyond the coney dog (but we do love them). 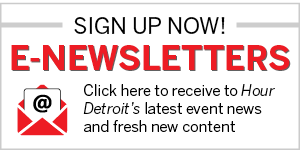 And judging from the letters we receive, feedback on our website and social media, and our sold-out Savor Detroit events, this is definitely a food town. And it seems like every week, there’s another area eatery to choose from. Dig in! Gold Cash Gold in Corktown, one of the many new restaurants that have opened recently in Detroit, is certainly memorable for its name, which was taken from the words that adorned the front of the building for several decades in its previous life as a pawn brokerage. The airy, $1.9 million renovation and rebuild tap in at 3,000 square feet in the former storefront and seats 80 in its various areas that include the bar, a divided dining room joined through a brick archway, and a newly opened outdoor patio. Gold Cash Gold sits diagonally across from the old Michigan Central Station, in the same block of Michigan Avenue as the famed Slows Bar BQ. In fact, the two are cousins, started by members of the same family. The food at Gold Cash Gold is very good. The standout is the fried chicken, about the best I’ve had in a long, long time. Other very inventive menu items include a gin-cured Scottish salmon with Greek yogurt, an old-style cassoulet with a modern twist, and a dish that consists of three versions of cauliflower: roasted, pickled, and puréed and topped with fresh herbs, capers, and raisins. 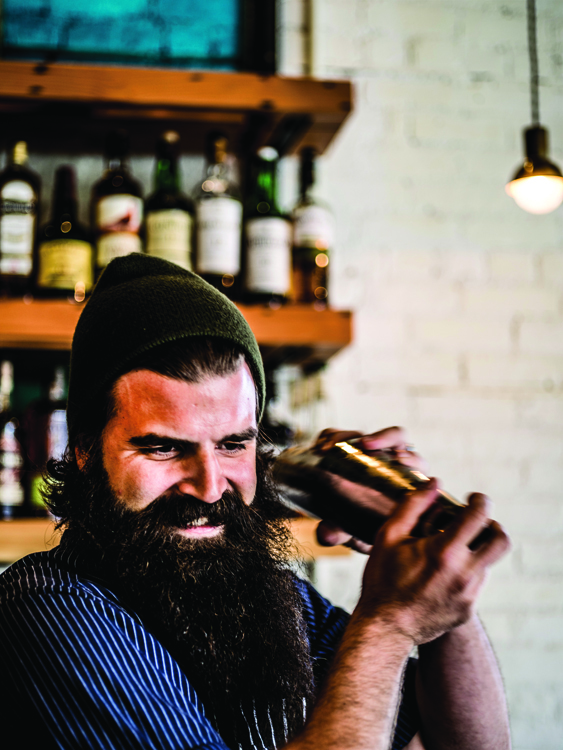 Chef Josh Stockton’s food is sharp, bright, and unusual at certain spots. Stockton previously worked at Blackberry Farm resort in Tennessee and the Wynn hotel in Las Vegas, and he brings a very urbane style to many old-hand American dishes, with influences from southern roots. The plating style of the food is very much in step with the American country cuisine and look, those white plates full of orange coating of fried chicken sitting beside a triangular wedge of cornbread, and a mini-Mason screw-top jar filled with gravy sauce. The first-course items include plates of mildly pickled vegetable; a popcorn that has been spiced the way the French might do it: garlic-chili butter and four spices; and strips of crisped pig ears, served with papaya chutney (very good, actually). And there’s a chicken liver mousse with onion relish and grilled bread, which I like other than I found the chicken livers slightly too pungent and needing to be toned down a tad. Our table also ordered a very good simplified version of cassoulet, which arrived in a one-person cast-iron oven skillet with a fried egg on top, a little more boisterous than the traditional version. A plate of short ribs was served sans bones, just glistening lovely savory meat chunks with carrot purée and rutabaga confit. A pan-roasted and quite sizeable brook trout was perfectly cooked, moist, and perked up by grilled radicchio and endive. As much as the food and service are excellent, I part company with the décor. It’s the restaurant version of college dorm room design, with an overly used, repetitive type of maison à la bric-a-brac restaurant look. The same goes for the table settings. The cutlery has the appearance of used institutional silver, and the plate ware is clunky hospital and cafeteria white, the kind that might have served a tour of duty in the Detroit Public Schools. Tables are the size for two and four people and are easily joined for larger parties, as was the case on at least one of our visits. Seating is on a wood-plank banquette along a wall on one side, with burlap flour bag padding at the lower back level, and a quite uncomfortable French café chair on the other side. I swapped it out with a slightly sturdier version at the next table. Why make a big deal of this? Because any dining experience is made up of three main components that need to be in balance: the food, the service, and the ambience. At Gold Cash Gold, the first two get A’s, and the ambience gets a C-. Overall, and aside from my very personal reservations, Gold Cash Gold is worth the visit for the excellent food and service. You couldn’t ask for more in those two areas. It is also worth the visit to wander that area of Corktown now and see the uplifting changes dotted in between a lot of the old and weary. You can hear it in the enthusiasm of the young staff, so many of whom live in the area and just love what Detroit is becoming. 2100 Michigan Ave., Detroit; 313-242-0770. L & D Tues.-Sun. 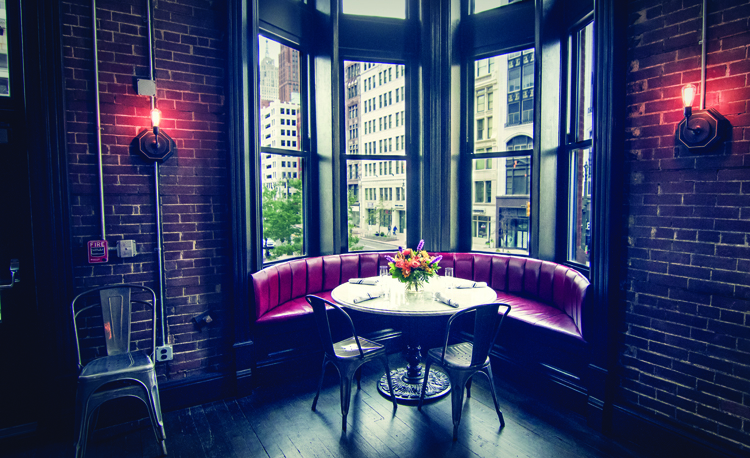 The sophisticated Wright and Co. offers a brief but well-done American bistro menu as well as proximity to downtown destinations such as Comerica Park. Occupying the former second-floor ballroom of the old F. J. Schwankovsky Company building, Wright & Co. boasts evening views that are pure cityscape. Standout dishes include super-fresh gulf shrimp and distinguished pork belly sliders. There are also craft cocktails, beer, and a well-selected wine list. As much as this is about food, it’s even more a story about rebirth. This city has an earned character, and there is a quiet, new kind of undeniable awesomeness to it. 1500 Woodward Ave., Detroit; 313-962-7711. D Mon.-Sat. Selden Standard has plunked itself right in Cass Corridor, driving its shovel into the churning rebirth of Midtown and adding a modern restaurant with a knowledgeable waitstaff, a talented chef, and flawlessly executed American Modernist cuisine. The small-plates menu with dishes such as roasted cauliflower in tahini sauce and rabbit ragu snares the diner with a deep concentration of flavors and textures. The restaurant itself is a phoenix rising from an old dry cleaner. With its emphasis on seasonal hand-crafted food and farm-to-table cooking, it’s among metro Detroit’s best new restaurants. 3921 Second Ave., Detroit; 313-438-5055. L Mon.-Fri., D daily, Br. Sat-Sun. 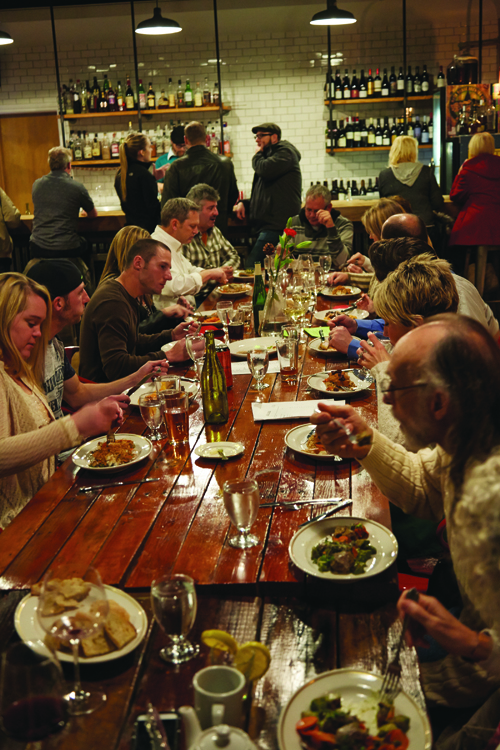 Even though it would fit right in as the latest city hot spot, the Mulefoot Gastropub is putting the Thumb on the culinary map by drawing diners from near (Detroit) and far (Europe). 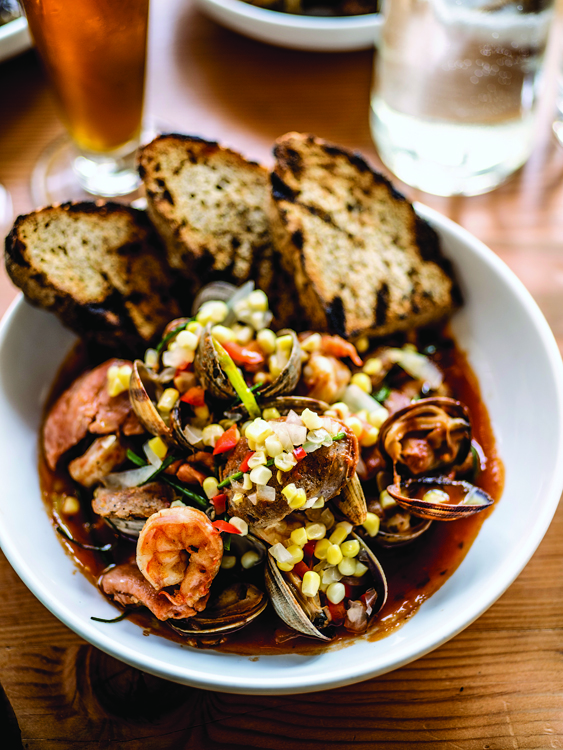 Twin chefs Mike and Matt Romine created a well-composed seasonal menu that celebrates local ingredients — not only their namesake pigs but also shrimp from Okemos. Community focus sets it apart. Before opening, Mike Romine offered shares in its CSR program to boost capital. 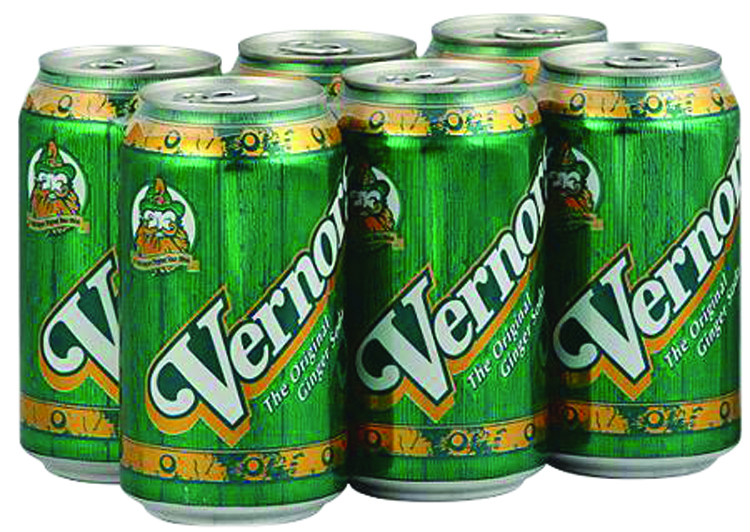 Based on its popularity, it has delivered investors a good (and tasty) return on investment. 596 S. Cedar St., Imlay City, 810-721-1019. D Tues.-Sun. William Roberts consistently hits the bull’s-eye. The Roberts Restaurant Group now has six restaurants. The newest, Bill’s, has an upbeat atmosphere that pays homage to the past (but is by no means stuck in it). A menu that combines reimagined retro dishes, such as escargot stuffed mushrooms, clams casino, and frog legs with contemporary dishes including rib-eye and New York strip steaks, hits all the right notes. An excellent wine and cocktail list accompanies the fare. Riding herd on Bill’s is Lea Schofield, recently named the Michigan Restaurant Association’s Restaurant Manager of the Year. 39556 Woodward Ave., Bloomfield Hills; 248-646-9000. B, L, & D Mon.-Sun. This massive grocery store/trattoria has turned Plymouth into a food destination. Take out your grocery list, visit the restaurant located just past the homemade gelato counter, or do both. 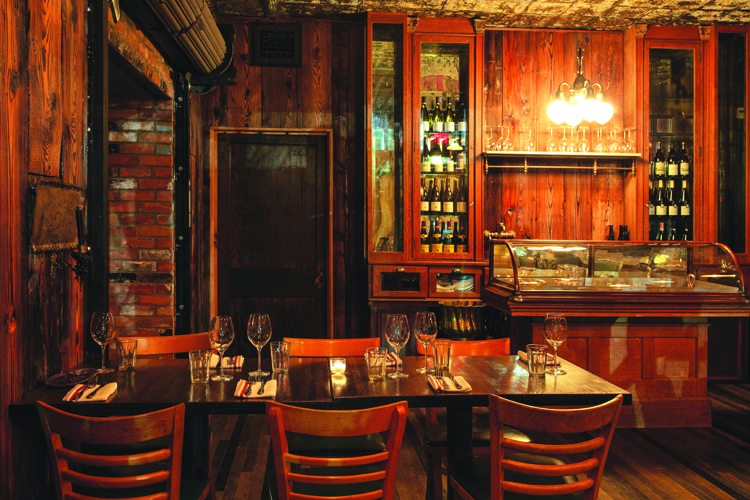 Trattoria’s atmosphere is friendly and casual, but could easily be a romantic date spot. Tall ceilings with large windows, white linens, a fireplace, and a fountain — along with a bar that glows blue — come together for a welcoming space. An outdoor patio is available in the summer. 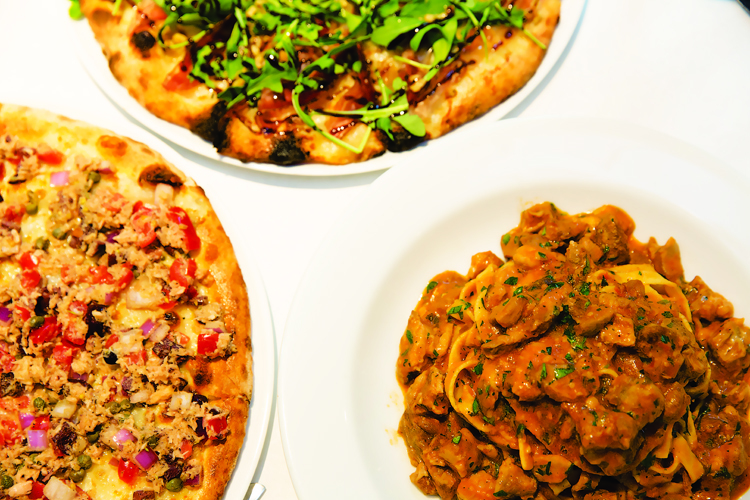 The large menu boasts classic Italian dishes with fresh ingredients coming straight from the source — next door. A large wine list is available. 15550 N. Haggerty Rd., Plymouth; 734-420-1100. L & D Mon.-Sat., L Sun. There has been a lot of buzz about this addition to Royal Oak’s restaurant scene. The revamped building has curb presence with its black, shiny glass exterior. It is also coupled with Sabrage, a second-floor nightclub. But it is the food and menu that really shine. The kitchen turns out enticing, good dishes with fun twists — from gently spiced, hot sizzling marrow bones to a steak tartare with the appropriate balance of condiments to beef. At first glance, the menu appears pretty standard. But Bistro 82’s side dishes and other accompaniments make them all quite different. 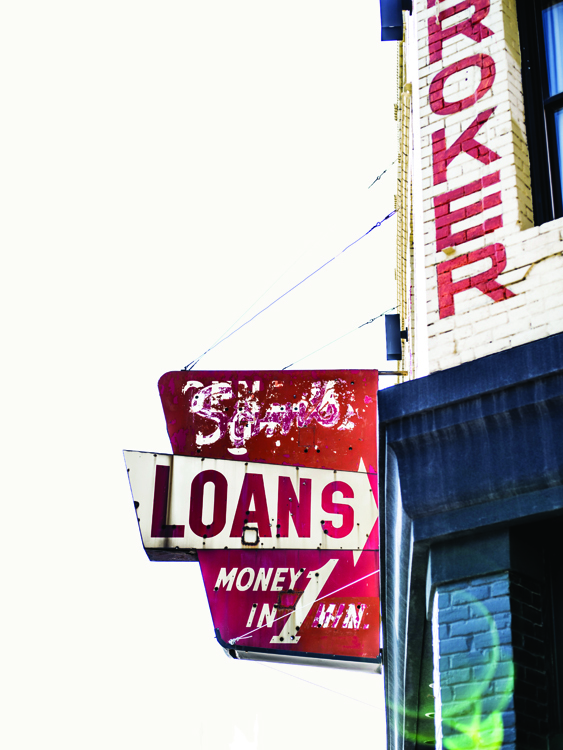 401 S. Lafayette Ave., Royal Oak; 248-542-0082. D Tues.-Sun. Br. Sun. Green Dot Stables: The 20-plus choices of inexpensive sliders are awesome, plus good beer selections to wash down the truffle and herb fries. Lager House: Rock ’n’ roll acts, $2 PBRs for the hipsters, plus some surprisingly good vegetarian choices. 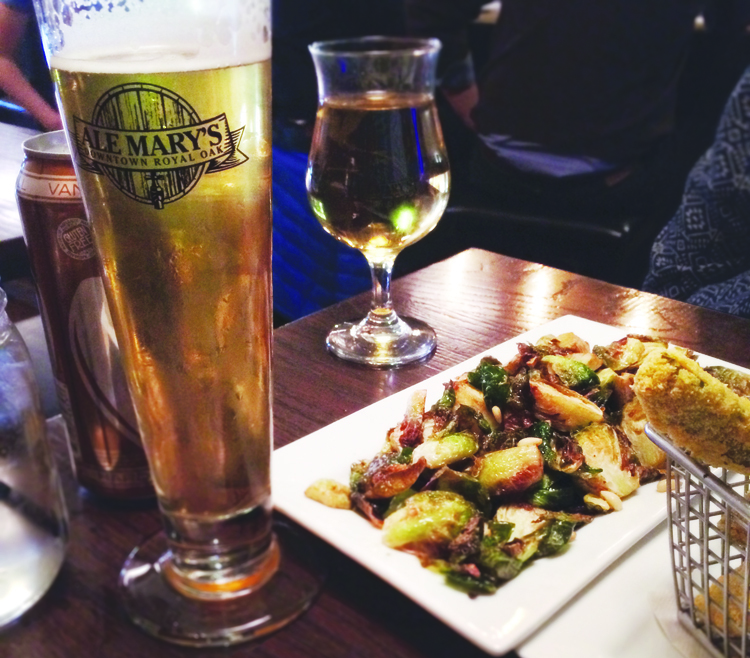 Ale Mary’s: Plenty of rotating taps with great grub. Sausages are the star, but the “beeramisu” dessert rocks too! Downtown Townhouse: The popular Birmingham bistro is opening a second spot at One Detroit Center. Au Cochon/Arthur Avenue: Peas & Carrots hospitality plans a French brasserie and an Italian eatery in Birmingham’s former Chen Chow space. Grand Cirque Brasserie: Jacques Van Staden (who helmed Bistro Joe’s opening) plans a Parisian-themed restaurant in the David Whitney building. Bucharest Grill: Conveniently located next to the Park Bar, this Mediterranean snack counter serves up a chicken shawarma unlike anyplace else in Detroit. Sweetwater Tavern: This Bricktown area favorite is known for their chicken wings, marinated for 24 hours and drenched in spices. Miller’s Bar: This no-frills spot serves up a classic (and delicious) burger, with a thick beef patty and fluffy bun, served simply on wax paper with a condiment tray.